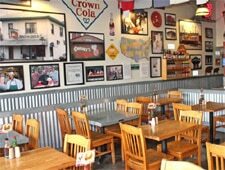 Family-friendly barbecue eatery in downtown Huntington Beach. : Proprietor Tim DeCinces has yet again created a family-friendly barbecue joint with his signature items (sweet potato fries, baby-back ribs, beef brisket, pulled pork sandwiches, blueberry cornbread, banana pudding) and some new gems (barbecue pizza, pulled pork Caesar salad, brownie sundae). Beach Pit BBQ also features good wine and draft beer selections. For the holidays and on special request, the Beach Pit smokes up spice-rubbed turkeys, hams and prime ribs overnight for easy-to-prepare family feasts.